My best wishes to the ACME Team for putting up this Platform of NABH Hospitals for the Public. This will definitely improve awareness on the NABH and help people choose such Quality Validated Hospitals for their treatment. Out of over 50,000 recognised Hospitals and Labs in the Country, only about 850 Hospitals & 760 Labs as listed on this Platform have been approved by NABH & NABL. Patient Safety ensured through proper infection control protocols, avoiding medical negligence and errors and protection from fire and other accidents. Patent satisfaction regularly monitored resulting in more courteous staff, less waiting, better services and amenities. NABH is now an Institutional Member as well as a Board member and Member of the Accreditation Council of International Society for Quality in Health Care (lSQua). The NABH Standards define the minimum requirements that are internationally accepted for a proper health care system with specific focus on patient care and safety. Thus the NABH covers the entire range of operations and services provided by the Hospital, right from registration of patients and their initial assessment to laboratory services that will be offered in-house as well as those that will be outsourced, display of patient rights & education, policies & procedures on care of patients, management of medication, hospital infection control process that has been deployed, facility management & safety, Human resources management and patient information management systems. 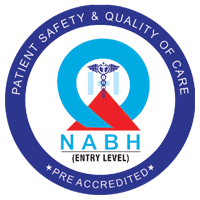 NABH Entry Level Certification Standards, is the first milestone in a Hospital’s journey towards excellence in Quality of Patient Care and Safety. Complying with this Standard from the National Accreditation Body ensures the Hospital maintains all the essential clinical and non- clinical practices, important for the operation of a well-managed Hospital and which will have a bearing on the quality of care being provided to patients and their safety. The aim of the NABH Entry Level is to introduce Quality and Accreditation to the Hospitals as their first step towards quality awareness and capacity building. Once this Certification is achieved, the Hospital will find it much easier to prepare and move to the next stage - Progressive Leveland finally to Full Accreditation status. The NABH Entry Level Certification is accepted as a minimal criteria for empanelment of Hospitals by all Private and Public Sector Insurance Companies as per the guidelines issued by the IRDA – Insurance Regulatory & Development Authority. It has also been made a mandatory requirement for all Hospitals by State Insurers like the CM’s Comprehensive Health Insurance Scheme in Tamil Nadu, the Dr NTR Vaidya Seva Trust, Andhra Pradesh, Aarogyasri Healthcare Trust of Telangana, RSBY, RGJAY, the Suvarna Arogya Suraksha Trust and Vajpayee Arogyasri of Karnataka. In fact the Standards have been developed with their active support and involvement. NABL is a Constituent Board of Quality Council of India. The laboratory accreditation services to testing and calibration laboratories are provided in accordance with ISO/ IEC 17025: 2005 ‘General Requirements for the Competence of Testing and Calibration Laboratories’ and ISO 15189: 2012 ‘Medical laboratories — Requirements for quality and competence’. NABL has been established with the objective of providing Government, Industry Associations and Industry in general with a scheme of Conformity Assessment Body’s accreditation which involves third-party assessment of the technical competence of testing including medical and calibration laboratories, proficiency testing providers and reference material producers.